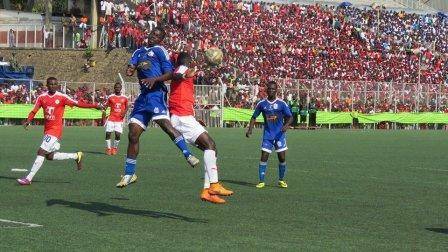 Jafali Chande scored the only goal in the second half to inspire Big Bullets to a 1-nil victory over sworn rivals Mighty Wanderers in the Super League played at Kamuzu Stadium on Saturday afternoon to open up a 10 point gap over second placed MAFCO F.C. Bullets were coming from an emphatic 4-2 victory over Red Lions a fort night ago whilst Wanderers were looking to bounce back from their disappointing 1-nil defeat to Kamuzu Barracks. The hosts had their closest chance in the opening 3 minutes when Sankhani Nyirenda won a ball just outside the penalty box but failed to score past Richard Chipuwa in an unbelievable circumstances. Bullets were pressing harder as Nyirenda missed another golden opportunity when he was found unmarked in the penalty box. Wanderers then settled down just before the half hour mark as Isaac Kaliyati released a 28 metre drive forcing Chimwemwe Kumkwawa to make a stunning save for a corner. Bullets (in red) open a ten point gap. The Nomads dominated possession, displaying more intensity with the ball and more creativity in attack. Ibrahim Sadick was taken off for Mike Kaziputa. Despite playing second fiddle in the half, Bullets almost scored from a free kick when Jellesi Lufeyo managed to beat the Nomads wall but not Chipuwa who tipped the ball over the cross bar. Diverson Mlozi came in for ineffective Nyirenda but he too failed to make an impact as Kondwani Lufeyo, Stainley Sanudi, Ted Sumani and Peter Mselema stood firm to deny Bullets from finding the back of the net. Bullets kept pushing hard for the opener and Mlozi drew a good reaction save from Chipuwa in the 51st minute. But finally, the league holders got their goal in a dramatic fashion. Lufeyo’s low drive pass released found Mlozi who managed to utilized on a slipped ball from advanced Chipuwa to find Chande unmarked and he made a simple finish to put the ball into the empty net, 1-0. 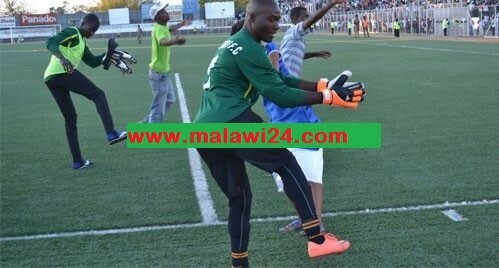 Few minutes later, Kaziputa’s penalty shoot was turned down by referee Dennis Ngulube to arouse the anger of the visiting fans. Mlozi could have completely sealed the victory for the hosts but he shot went straight at Chipuwa. Eliya Munthari who came in for Muhamad Sulumba, went on a swerving run into the box, and drew the attention of keeper Kumkwawa but the shot was cleared by Chikondi Likwemba. In the 79th minute, Kaliyati found an unmarked Kondwani Kumwenda in the box but the former Azam Tigers midfielder fired wide with the goal keeper to beat. Henry Kabichi came in for Lufeyo and Alfred Manyozo Jnr coming in for Malumbo Gondwe for the Bullets and Nomads respectively. The clock was ticking for the Nomads as Bullets slowly started killing off the game by frustrating the Lali Lubani boys with unnecessary stoppages. The last chance for the Nomads came through Kumwenda again whose header was well cleared by Bullets defense and after 90 minutes of play, it ended 1-nil in favor of the league leaders. The result sees Bullets opening a 15 point lead over their rivals and a 10 point lead over second placed MAFCO who beat Blue Eagles at Chitowe Stadium. The result also sees Mighty Wanderers recording a third straight loss in the second round of the league. Bullets has now played 17 league games without testing a defeat and they are topping the league with 41 points. Likwemba, who was solid at the back for Bullets, was named man of the match. And at Balaka Stadium, Red Lions bounced back in style to beat Epac FC 2-1 to dislodge Wanderers in the 7th position. olo mutanena kuti nyerere pa #15 inebe ndili nganga nayo.mwamvaaa all dys r nt sundyz tidzachita bwino. Ine ndekha ndi Mzalangwe FC,kutibula zolimba. Koma yha…..BB ndi more, nkhani yokhayi palibe angasuxe! kkkkkkk mamuna wanga bullets kundimvetsa kukoma,,,lol neba ayaya mpaka 8??? Musamalimbane ndi Noma, tamapangani zanu, Shupiti zanu. A yaaya Ngoleka Fc pa #8 kkkkkkkkkkkkkkkkkkkk! i can conclude that bullets are the champions, the reason being the gap is too big. Prince Mambo. +27817109694.Free Absolutely Free No Money No Fees No Charge .There Are No Fees To Get Gree Astrology Consulting Solutions. 22 Years My Experience 19 MY Confidence. My Work Is My Identified. Immediately Solve Every Difficult Problem Difficult To Solve The Problem And Obtain 100%All Life Problem Solution 100%Guaranteed Results . Famous Astrologers In INTERNATIONAL TOP . India Top 10 Astrologer & The Best Great Online Astrologer India In Gold Medalist Astrologer . Astrology Does Still Like The Sun Light! The Only Place The Truth And Trust . MMMMMM !! PA FIRIYI PO. THE CENTRAL BANKERS OCHIMWENE. Usatikwane ngati chovala cha m’ kati iwe admin. who doesnt know u that u are BB supporter!!. Sindikamba zambiri ,koma Bullets yokhayo imandifikapo. Ikakhala yanga Silver strikers ndiye ili mu top three moti UEFA imenya nawo.Ziribwino kobasi.Chikaiko ndiribe. Ikakhala yanga Silver strikers ndiye ili mu top three moti UEFA imenya nawo.Ziribwino kobasi. so the way befoward wanderers is going down, it will not discover oil? 8!! !4 ever no matter what. ii enawo mmene anzao amawina anali kuti? Tili pambuyo pa BB wawa. catch us if you can!!!!! #BULLETS. A team with best sguad but is on position 8 kkkk mapuleya omwewo kubwela kwa ife muzawawona kulimbikila inu kudabwanso. kumwa wa milk mosalekeza.Thenx Jaffah 4 scoring zat goal. ikodi chifukwa chani silver strikers sadapatse game over the weekend? Bullets aaa Bullets aaaaa ndinu akamuna mukundivetsa kukoma. bt indeed money is not an answer fo everything,b 4wads hav money and hav bought a number of gud player bt failing to play real football,and my team i accept it is poor,bt we do not consider our poverty bt rather gud football on ground,as it has happened,it has clearly shown that the calsberg cup final was alittle bit corruptional,its either nomadz gave something to referee or these rumours about ayaya are true,bt the coach for nomadz shud nt b blamed,Eliya is gud coach,nomadz hav to find out the main reason behind restricting them from winning since the starting of this season,,,as for my team,am calling on all player to kip on gving us fresh milk as it is our everlasting culture,maule 4 lyf!!! a Malawi 24 ndi zitsiru headline imakamba zina kma the story completly parallel cz I ddnt read d part wch said the nomads were fired teargas!!! ndekuti tinene tsopano mankhwala ophera nyerere ndi chani? Ndikuthokoze iwe #commander wa ma #pale_JAFALI_Chande ponyekweta anawa. Matimu ndionse koma bullets nde ayaya ayaya! !! #Madala_mafo aha #madala_mafo, matimu nde ndiose guyz koma #buleets_ndendi_ayaya_ayayaya!!!!!!!! #BFORWRD_anabetsa and they are now #crying_over_spilted_milk omwe azawo tikumwawu kikkk koma #Red_army_ndimoreeeeeeee!!!!!!!! Thats wy i luv Maule,Bg up! kkkkk aneba asadandaule tizawagailako ma points ine munyamata woikonda bb. maule woyeeeee!! neba ziiii poti tathana nayo kale, malilowa tikaika lolemba mawa tikaphele kaye, pepani anafedwa nose zimachitika..
Ife ma bb tafufuta kambiri kaja kukhosi kuli beeeeeeee! Bullets for life,neiba wamwanso wamandimu zakuonekera.maule woyeeeeeeeeeeeeeeeeee tamwanso wamkaka mwanthaw zonseeee. Taima pa #8.Next game tili pa #7 mpaka kumtundako. juju fc wawina,,but tamagwiritsako ma skills ako oxati amatsengawo. Wenawe ukabweze kaye ngongole ya Ayaya ija. Apo bi uzingothidzimulidwa choncho. 8 teams fro central region?? Koma magalimoto awanthu apulumuka kumeneko? Pali Nyerere zimagenda moyipa! Apapa tangotengani chikhocho mukapereke ku office ya #Buletts, tizangomenya ndi B4ward pozapereka chikhochi nangasi si tiazawinaso nkale. Koma inu amanoma think twice ikakhala maule yaluza inu kukamwambe ndipo kumakhala kopanda zisokonezo pliz muli anthutu ozindikira mu team imeneyi ma surpoters awo but mukufunaso muwasanduse masage? I said it that the government should introduce wrestling people want to fight. BB For Real life man!!!! Ngati mwalephera kuchinya ngakhale cha offside mumati Ref autenge mpira ndi manja akauponye mu net yathu? Zamanyazi! BB kuwina ndi khalidwe lathu SIZACHILENDO. Mphechepeche mwanjovu sapita kawili …Neba wapanidwa mutu kweeeeeee..!!! U have th rite to ko us names,its ur day mwawina.bt wit us life goes on afta all its not news kuluza manoma tazolowela.we luz sum we win sum thts jst the way it is.ur time to cry wil come jst wait.jahman ndiuyo mwasandusa wosunga juju. Ayaya Ndiife? Muxova #team_bullets, Ndumwa wamkaka! Ma Sapota A Bullets Ndifeyo. Amamuderera Goal Keeper Uja, Amvekere Amuchinya Zgol 6, Amene Uja Nd Chimwemwe Hapiness Machine Kumkwawa, Without Owen Chaima And Vin Mgona Mumaona Ngat Tivutika? Chpuwa Ndy Chan Chmenecho, Chnyama Chanj? Some people say,we won a game with a help from referre,not really,that was Salvation from God. uyisova neba koma ine mtima myaa! !Congrats guyz!! !Bullets 4 life!!! Tasova kale,thats y mwawima kaa. BB ndi team yadziko, wina @ fweeee! UMODZI – UMODZI OCHIMWENE. THE CENTRAL BANKERS. PA FIRIYI PO. walemberanji zimenezi?moto umapita kwasala tchire iweso uwona? TALEMBANI NKHANI ZINA MONSE MWAYAMBIRA NKHANI IMODZI YOMWEYI,TAMVA NDITHU KUTI YAWINA AAAA MUSATINYASE NAZO IZI. MA BANKER NDIYE KUTI CHANI? MUCHOKA NDI ZERO THIS YEAR…CHOKANI APA..
De pipo’s team imeneyo siza bwelera zinazi ayi. bullets,the greatest soccer club in malawi. No sponsors,but the job is getting done,ayyy ayyy ayyy !what a team oooooo,! TALUZA MUMALO OTIPEPESA U R BIZE KUTIWAWISA MITIMA NDI MITU,BWANJI MUZINGOPITILIZA KUMWA WAMKAKA TISAYAMBANEPO APA IFE TIKULILA PLZ. si a noma koma anthu okwiya ndi momwe boma likuyendetsera dziko ili. Ndidziwa kuti nonse mwaika ma comments ndinu a bg bullets koma osama iwa nyelele ndi team ya ma boss pomwe bg ndiya ma vendor. aiyaiya koma BB Eeee bwanji tipephe Mtawali adzatengeko BB as national team anyamatawa amalimbikila kuposa nation team hish! Zaziiii!yanga ine ndi zaragoza full stop! 8, ndipo sindingaisiye yokha team yi, tsiku lina zidzayenda. Noma woyeeeee…. Nomads,4 beta,4 worse,come rain,come sunshine. Ndachokela nayo kutali sindingasiye kuisapota leroyi. Kma neba suliraaaaa!!! Sunyera gedeeee?? Apa Tipatse Ulemu Bb Yatenga Basi. Anoma Alibe game in hand?? Pa chithunzipo pali ma player a Bullets atatu ndi a Noma awiri. Nde kuti game imayenera kutha 3-2, kungoti ref anangowelengera chimodzi atapanga masamu ochotsera. Kodi nde kuti kunalibe ma penalty lero? Ok, thats why Noma siinawine eti. Anyway, next time. Red Army,ma Palestina bambo.Ndimati chikanakhala chipani enawo akanangoleka.B4wadi kuzolowera kubelekedwa. a noma ndinkhalidwe lawo,,,,,,ma team ndionse guys koma Bullets yokhayo ndi ayayaya!!! Osachulusa gaga n’diwa Maule basi. is it big teargas or big bullets? Abale muuzeni neba njira watengayo ndiyolakwika muongoleleni akupita kuti ndi ayaya akewo? MANOMA NDI NYELELE TILI PA NUMBER 8 MESA MWALEMAA KALE NW Y ASK? @Avail @kay @Smart ngati mumatsatiladi mpira Fodya,Sailesi onse tinawaimitsa ,mwachinya chigoli pomponda goalkeeper mmanja referee mkumati chigoli. Yamikani Fodya & Miracle Gabeya onse anse anagwira mu 18yard box,ma penalty awiri. Kodi nanuso zinakuwawani?Remember what happened during the carsberg cup final?Ref.wanu sanatikanire straight forward penalty? The problem si ma team but officiation.Ku Malawi kuno mudamvapo kuti ref.amupanga suspend chifukwa chosayimbira bwino? If your team is position first just like me “hit like for Big Bullets FC!!! Catch us if u can! SITIDZASEWELANSO NDI BULLETS NDI TIMU YAIKULU TAVOMEREZA. Story well started nde muyimalidzisetso bwinobwino….otherwise good job and always make sure you have a catchy headline bosses…. Pepa neba ndichoncho mawa ndiwe uzasangalala. Am a Noma fan but we are becoming savages,I didnt like the way we acted. Football its not war,I hate it when see pipo a being beaten coz they support bullets..
Ndiye simunautsate mpira wadzulo kaya ngati mumamvera pawailesi mukhoza kuona ngati anthu amalakwisa. I saw everything the tear gas and every moment of the game..my position still stand football its not war. Once Nyelere Always Nyelere. MAULE, Mxwii ! BB ndi timu yaikulu, Tinati ndi tiana toti tikukunthidwa mu round 1!!!! Walira neba mokweza kkkkkk koma bullets yokhayo ndi ayayaya, ayayaya! nomalds military vs big bulletsf fc zingayende? Amayiiiiineeee,aaamayoooo,hiiiiii,ndi….ndi….ndima….aaamayeee…ndimadziwa ine…haaaah mayooo,chaina salimba..japan wachabechabe uyu..
Jafa wazithira madzi nyerere zayanjama lero.M’paka kufuna kuyamba zipolowe?Vomelezani kugonja,Bullets ndi akatundu kuntunda kwenikweni. Always noma, why noma only brings violence to football? Plz SuLOM do something to stop this idiots we are tired of them..
AAAAAAAAAAAAA !!!! INE WA MA BANKER KUSOWA VOTI TIKAMBE MANJE. KKKKKKKK Awombereni Amenewo Makani Too Much! awa ndakuvwapo java lutiliya nayu bullets. Thanx neba fr congras us.indeed bullets siteam yoyetsera maplayer. Osakaziponya Munyanja Ngati Zakuwawa Bwanji? guys osaphana awa ndi masewela. Kalipileni kwa ayaya muyambeso kuwina kukubweraso nkhwazi yakulilongwe muzayambaso zipolowe. M’nena chani sopano,inu ndinu ana.Carlsberg ija m’natigwera,Sulumba waziona lero,m’paka kutulusidwa,u striker wanji umenewo.M’nanena zambiri koma zakubwelerani nokha.JAFA gona bwino,wagwira ntchito yotamandika. there was a foul on the goalkeepeer in the build up to that goal…….the ref allowed play to continue….too bad…. Ndiye mpira ungatukuke ndi ma referee ake amenewa?? kkkkk musova, mubandilibwa basi… za ref mukudziwa ndinu. AYONA UMPHAWI UDZAKUPHANI !! MUDZISEWELA NDI DEDZA!!! Kula box yanga ya miyala ija ili pati? Wa miliki tamwa…no khawa. Unbeaten kupitilira!! Ife BB ndi wa Nkwakwaaa!!!! Awa ndi akazi athu avomeleze. Thanks Malawi 24 for the updates..you are doing a good job indeed. CONGLATES MAULE U PLAYD BETA THAN US MANOMA.MWAWINA TAVOMELEZA THE DAY WAS NOT OURS TO WIN.NYELELE FOREVER AND WE DIE BLUE AND WHITE NOMATA KULUZA.